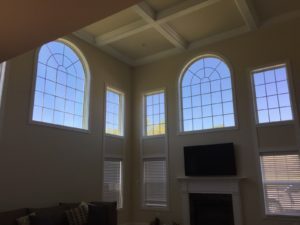 Huntingtown, Md – 3M Prestige Window Film was selected by this homeowner as the perfect solution to reduce heat and glare while preserving natural light. The result is an effective solution that significantly reduces heat (97% IR reduction) yet transmits 60% of the natural light. 3M Prestige Window Films have a patented design that virtually eliminates damaging UV rays and IR heat from the sun. They are constructed without any metal so they create no optical distortion. By adding 3M Prestige Window Films, windows become like HD monitors. Colors seem more intense, and your vision is more natural due to reduced glare. Our window film is attractive, durable and energy efficient, reflecting solar energy heat in summer and keeping in heat in the winter. Glass window film also reduces glare, blocks 99% of ultraviolet rays, increases privacy and provides added security against break-in, vandalism and graffiti. Our company is fully insured and is one of only a few licensed glass tinting contractors in the DC area. Please ask to see our references. Contact XLNT Tint today at 410-257-5511, or browse the website for more information about our products and services.